20 pin PLCC. 300 mil span DIP plug. Auto-eject socket. 20 pin PLCC. 600 mil span DIP plug. Auto-eject socket. 20 pin PLCC. 300 mil span DIP plug. Lidded ZIF socket. 20 pin PLCC. 600 mil span DIP plug. Lidded ZIF socket. 28 pin PLCC. 600 mil span DIP plug. Auto-eject socket. 28 pin PLCC. 600 mil span DIP plug. Lidded ZIF socket. 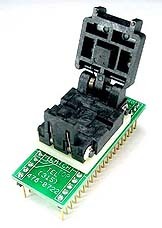 32 pin PLCC. 600 mil span DIP plug. Auto-eject socket. 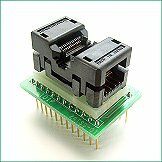 32 pin PLCC. 600 mil span DIP plug. 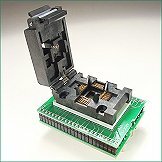 Lidded ZIF socket. 44 pin PLCC. 600 mil span DIP plug. Auto-eject socket. 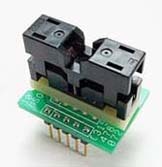 44 pin PLCC. 600 mil span DIP plug. 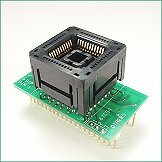 Lidded ZIF socket. 32 pin QFP. 600 mil span DIP plug. Wired 1:1 by signal. 32 pin QFP. 600 mil span DIP plug. Wired 1:1 by pin number. 44 pin QFP in 13.2mm overall package. 600 mil span DIP plug. ￥34,900 44 pin TQFP in 12mm overall package. 600 mil span DIP plug. 44 pin QFP in 13.9mm overall package. 600 mil span DIP plug. QFP 0.5mm pitch, 7mm body, 1mm lead. 600 mil span DIP plug. Wired 1:1 by pin number. 28 pin TSOP 11.8mm body, 13.4mm overall package. Wired 1-1 by signal. 600 mil span DIP plug. 32 pin TSOP 12.4mm body, 14.0mm overall package. 32 pin TSOP 18.4mm body, 20.0mm overall package. 40 pin TSOP 12.4mm body, 14.0mm overall package. 40 pin TSOP 18.4mm body, 20.0mm overall package. Wired 1-1 by pin number. 600 mil span DIP plug. 48 pin TSOP 18.4mm body, 20.0mm overall package. 8 pin TSSOP 4.4mm body, 6.4mm overall TSSOP package. 600 mil span DIP plug. 14 pin TSSOP 4.4mm body, 6.4mm overall TSSOP package. 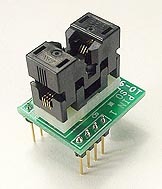 16 pin TSSOP 4.4mm body, 6.4mm overall TSSOP package. 18 pin TSSOP 4.4mm body, 6.4mm overall TSSOP package. 20 pin TSSOP 4.4mm body, 6.4mm overall TSSOP package. 24 pin TSSOP 4.4mm body, 6.4mm overall TSSOP package. 28 pin TSSOP 4.4mm body, 6.4mm overall TSSOP package. 300 mil span DIP plug. 8 MSOP 2.8mm wide, 0.65mm pitch devices. 300 mil span DIP plug. 8 MSOP 2.8mm wide, 0.65mm pitch devices. 600 mil span DIP plug. 10 MSOP 3.0mm wide. 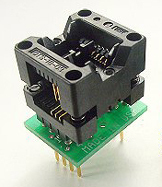 0.5mm pitch devices. 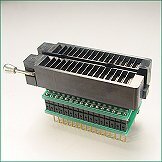 300 mil span DIP plug. 10 MSOP 3.0mm wide. 0.5mm pitch devices. 600 mil span DIP plug. 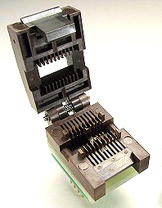 16 pin SSOP with 5.3mm body & 7.8mm overall. 300 mil span DIP plug. 16 pin SSOP with 5.3mm body & 7.8mm overall. 600 mil span DIP plug. 20 pin SSOP with 5.3mm body & 7.8mm overall. 300 mil span DIP plug. 20 pin SSOP with 5.3mm body & 7.8mm overall. 600 mil span DIP plug. 24 pin SSOP with 5.3mm body & 7.8mm overall. 300 mil span DIP plug. 24 pin SSOP with 5.3mm body & 7.8mm overall. 600 mil span DIP plug. 28 pin SSOP with 5.3mm body & 7.8mm overall. 300 mil span DIP plug. 28 pin SSOP with 5.3mm body & 7.8mm overall. 600 mil span DIP plug. 16 pin QSOP. 300 mil span DIP plug. 16 pin QSOP. 600 mil span DIP plug. 20 pin QSOP. 600 mil span DIP plug. 24 pin QSOP. 600 mil span DIP plug. 28 pin QSOP. 300 mil span DIP plug. 28 pin QSOP. 600 mil span DIP plug. 48 pin QSOP. 600 mil span DIP plug. 42 pin Shrink DIP package. 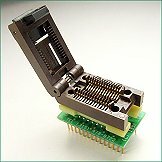 32 pin QFN. Wired 1:1 by signal. 600 mil span DIP plug. 8 pin SOIC 3.0mm wide, 0.65mm lead pitch. 300 mil span DIP plug. 8 pin SOIC 150 mil body, 271 mil overall package. 300 mil span DIP plug. 8 pin SOIC 150 mil body, 271 mil overall package. 600 mil span DIP plug. 14 pin SOIC 150 mil body, 271 mil overall package. 300 mil span DIP plug. 14 pin SOIC 150 mil body, 271 mil overall package. 600 mil span DIP plug. 16 pin SOIC 150 mil body, 271 mil overall package. 300 mil span DIP plug. 16 pin SOIC 150 mil body, 271 mil overall package. 600 mil span DIP plug. 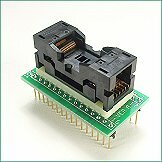 8 pin SOIC 208 mil body, 307 mil overall package. 300 mil span DIP plug. 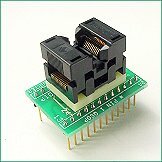 8 pin SOIC 208 mil body, 307 mil overall package. 600 mil span DIP plug. 14 pin SOIC 208 mil body, 307 mil overall package. 300 mil span DIP plug. 14 pin SOIC 208 mil body, 307 mil overall package. 600 mil span DIP plug. 16 pin SOIC 208 mil body, 307 mil overall package. 300 mil span DIP plug. 16 pin SOIC 208 mil body, 307 mil overall package. 600 mil span DIP plug. 18 pin SOIC 208 mil body, 307 mil overall package. 300 mil span DIP plug. 18 pin SOIC 208 mil body, 307 mil overall package. 600 mil span DIP plug. 20 pin SOIC 208 mil body, 307 mil overall package. 300 mil span DIP plug. 20 pin SOIC 208 mil body, 307 mil overall package. 600 mil span DIP plug. 14 pin SOIC 330 mil body, 472 mil overall package. 300 mil span DIP plug. 14 pin SOIC 330 mil body, 472 mil overall package. 600 mil span DIP plug. 16 pin SOIC 330 mil body, 472 mil overall package. 300 mil span DIP plug. 16 pin SOIC 330 mil body, 472 mil overall package. 600 mil span DIP plug. 18 pin SOIC 330 mil body, 472 mil overall package. 300 mil span DIP plug. 18 pin SOIC 330 mil body, 472 mil overall package. 600 mil span DIP plug. 20 pin SOIC 330 mil body, 472 mil overall package. 300 mil span DIP plug. 20 pin SOIC 330 mil body, 472 mil overall package. 600 mil span DIP plug. 24 pin SOIC 330 mil body, 472 mil overall package. 300 mil span DIP plug. 24 pin SOIC 330 mil body, 472 mil overall package. 600 mil span DIP plug. 28 pin SOIC 330 mil body, 472 mil overall package. 300 mil span DIP plug. 28 pin SOIC 330 mil body, 472 mil overall package. 600 mil span DIP plug. 14 pin SOIC 300 mil body, 457 mil overall package. 300 mil span DIP plug. 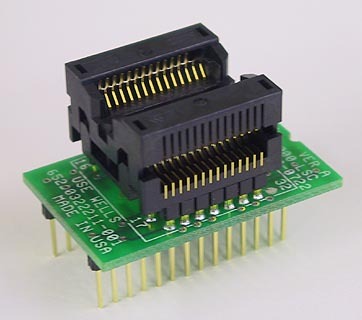 Adapter for 14 pin SOIC 300 mil body, 457 mil overall package. 600 mil span DIP plug. 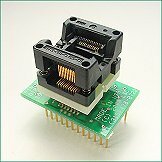 16 pin SOIC 300 mil body, 457 mil overall package. 300 mil span DIP plug. 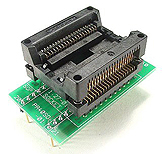 16 pin SOIC 300 mil body, 457 mil overall package. 600 mil span DIP plug. 18 pin SOIC 300 mil body, 457 mil overall package. 300 mil span DIP plug. 18 pin SOIC 300 mil body, 457 mil overall package. 600 mil span DIP plug. 20 pin SOIC 300 mil body, 457 mil overall package. 300 mil span DIP plug. 20 pin SOIC 300 mil body, 457 mil overall package. 600 mil span DIP plug. 24 pin SOIC 300 mil body, 457 mil overall package. 300 mil span DIP plug. 24 pin SOIC 300 mil body, 457 mil overall package. 600 mil span DIP plug. 28 pin SOIC 300 mil body, 457 mil overall package. 300 mil span DIP plug. 28 pin SOIC 300 mil body, 457 mil overall package. 600 mil span DIP plug. 28 pin SOIC 354 mil body, 457 mil overall package. 32 pin SOIC 11.4mm body, 14.1mm overall package. 40 pin SOIC 11.4mm body, 14.1mm overall package. 44 pin SOIC 13.3mm body, 16.0mm overall package. 20 pin SOIC body width 7.4mm - 7.7mm, lead pitch 1.27mm. 28 pin SOIC body width 7.4mm - 7.7mm, lead pitch 1.27mm. 32 pin SOIC body width 7.4mm - 7.7mm, lead pitch 1.27mm.